Woowho. It is always an exciting day when Stampin' Up! drops a new catty. 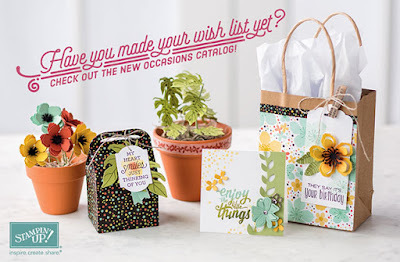 Starting today you can order from the new Occasion catalog and for every $50.00 you spend you can pick a free product from the Sale-A-Bration brochure. If you place an order with me this week Jan 5th thru Jan 9th I will offer free shipping. The order must be place thru me so I can override the shipping. Check out the new products and if you want to earn free products by hosting a party let me know we can get your party on the calendar. Have a blessed day friends. If you join my team this month... Stampin' Up! has a special happening. The kit is $99.00 this is the normal price but during the Sale-A-Bration you get to pick $155 worth of products from the either the Annual or Occasion catalogues. This is one of the best deals I have seen.